‘Tis the season for hot and festive drinks! If you’re like me and unwilling to spend a whopping $5-$10 every time you want a seasonal beverage, learning a few simple recipes you can make yourself will help satisfy your cravings from the comfort of your dorm. Making the perfect, cozy drink doesn’t take much more than a few ingredients that are sure to last you a while. Keep reading for some of my personal favorites. An easy way to revamp winter’s classic drink is to add some spice. A dash of cinnamon and nutmeg are sure to make your hot chocolate even more seasonally appropriate (and delicious). In a mug, add 2 tablespoons unsweetened cocoa powder, 2 tablespoons of sugar, a pinch of salt, pinch of ground nutmeg, and a pinch of cinnamon. In a pot, add 1 cup of whole milk and simmer over medium heat. Pour the hot milk into the mug. Stir until incorporated with the dry ingredients (about 1 min). Optional: add marshmallows or whipped cream on top! Full of sweet, creamy ingredients, this hot vanilla cider can be made as both a cocktail (with a splash of bourbon) or a mocktail. Combine 6 cups of fresh apple cider, 2 tablespoons of dark brown sugar, 2 whole nutmeg seeds, and 1 vanilla bean (split and scraped) in a medium saucepan. Remove from heat (and add bourbon if desired). Remove and discard any solids. Divide and top with vanilla whipped cream. This naturally sweet and spicy beverage is perfectly soothing in the cold winter weather. And better yet, chances are you already have these simple ingredients lying around your pantry! Heat 1.5 cups of milk (this could be dairy milk, almond, coconut, soy, etc.) in a saucepan over medium heat. Pour steaming milk over a chai tea bag and let it steep for 3-5 minutes. Stir in ½ teaspoon of vanilla extract and 1 tablespoon of maple syrup. Optional: sprinkle nutmeg and cinnamon on top. 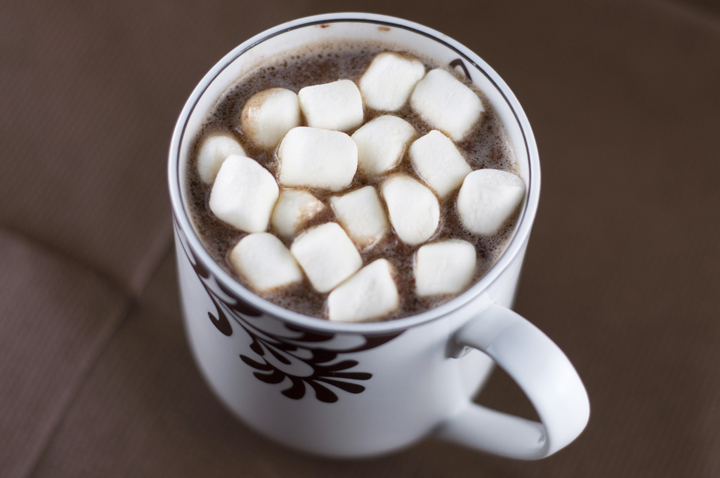 We hope you enjoy these tasty ways to keep warm while saving a few coins this winter!